It’s a challenge living in our house and being hungry unless a pickle, cracker, and squirt of mustard sounds like the perfect meal. Everything has to be prepared. I’d like to think that not purchasing packaged prepared food is more healthy and less expensive in the long run, but I know better. That would depend more upon the particular ingredients that fill my fridge, what type of recipe they’re destined for, and what size our servings are once we cozy up to our plates. I could open my own market with the food that fills our house. Or a bistro. When I was growing up, my mother shopped once every two weeks to stock our cupboards and refrigerator, and when you’ve been raised in a household like that, you get used to knowing that not much else competes with the excitement generated by grocery shopping Saturdays. The anticipation of unpacking the bags was always about wondering what had been purchased, even though it rarely differed from one month to the next. I don’t think I could ever get away with shopping only once every two weeks, but it’s ingrained in me to plan nearly a week’s meals, so I still struggle with buying too much food when I shop. I could blame it on being programmed to think about cooking for a family of five or six for a good portion of my life, or I might analyze that I’ve been permanently scarred by the lean days right before those grocery shopping Saturdays when all the Oreos had been eaten and the lone box of cereal in the cupboard was filled only with the crumpled inner wrapper and cereal remains. Oh the agony. Once we were old enough to be trusted in the commissary with my mother while she shopped instead of allowed wander about outside like the street urchins we were, we’d help her push the two carts she routinely filled. I was amazed at the array of food and products to choose from I’d never seen before. Of course I was familiar with products advertised on television, but those were so few compared to what lined the shelves, I was fascinated. My mother would tell you I wanted everything and was never satisfied, and I’d agree if you considered having a particular kind of tea, or different kind of jam could be classified as wanting everything. It was only food! My incorrigibility as a shopper has always gotten the best of me, especially at this time of year because so much is fresh and ready to be enjoyed; berries, stone fruit, tomatoes, and sweet corn are the types of food I want to taste every day. Unfortunately, instead of planning short trips to the market to purchase enough for a couple of meals, I purchase it all making grand plans to camp out in my kitchen for days. I give it a valiant effort, then realize I’ve far too many vegetables that something has to be done with and no, another salad won’t put a dent in it. I long for a food genie who will make dinner for me. Instead, I survey the shallow depths of my pantry knowing it will provide a few decent options depending on my motivation. A lasagna might be nice since there is a box of no-boil pasta, but the cheese drawer isn’t as ample as it once was since I’ve tamed that expensive habit. The black quinoa I found on my last trip to Henry’s might be tasty with vegetables, but I want to give it more thought than I’m willing to invest in dinner tonight. Fried rice is another idea, but it’s gotten quite the workout in recent months and has ceased to resemble any kind of the fried rice I’m quite fond of since I add whatever I have on hand to the skillet. I hesitate to reach for the arborio because as much as I enjoy risotto, it garners comments of undercooked and chewy no matter what I put in it. There are a few small potatoes for a skillet scramble as well, but that was on the menu night before last. I avoid opening the freezer, because it tends to be the last resting place for excess baking ingredients and left-over sauces, but tonight, there is the promise of that fabulous new pie crust recipe I tried and the left over dough I so carefully wrapped for another time. 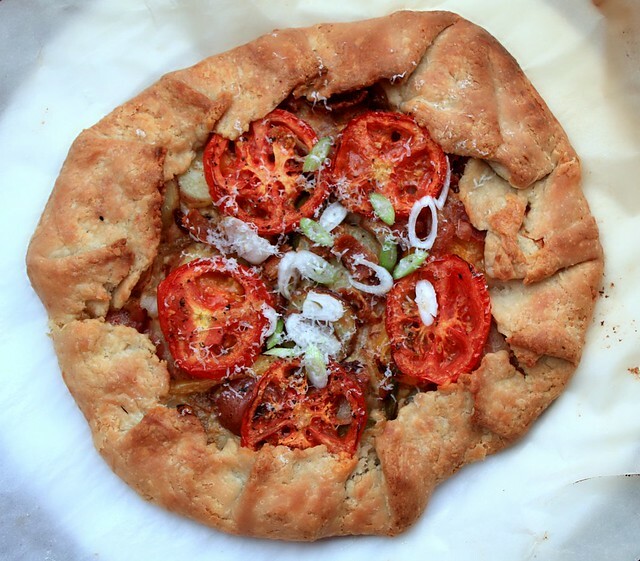 Sauteed veggies + bacon + pie dough = galette, which means I can avoid going to the grocery store one more night and perhaps think more constructively about curbing my food shopping habits. Preheat oven to 375 degrees F and if you have one, place a baking stone in the oven as it preheats. Place the small unpeeled potatoes (red, white, or fingerling) in a small pan of water and cook over medium high heat to a boil. Reduce heat and cook at a simmer until a fork can pierce the potatoes with a bit of resistance. Remove from heat and cool them in a cool water bath. When cooled, slice into circles and set aside. While the potatoes are cooking, in a large skillet, fry the bacon until done, but not crisp. Remove from skillet and drain on paper towels. Retain about 1 T of the bacon fat. Over medium heat, saute the peppers and onion in the reserved bacon fat until softened and just beginning to caramelize, about 5 minutes. Add the garlic and saute, about a minute. Add the potato slices and toss with the other vegetables briefly. Season with salt and pepper and remove from the heat. Roll out the dough between two pieces of plastic wrap to about 1/8″ thickness, about 15 inches in diameter. Remove the top piece of plastic wrap and invert the dough onto a piece of parchment placed on an inverted jelly roll pan or cookie sheet. With a spatula, spread the soft cheese over the dough, leaving about a 2-inch edge. Arrange the vegetable mixture over the cheese. Break the bacon into large pieces and layer them over the vegetables. 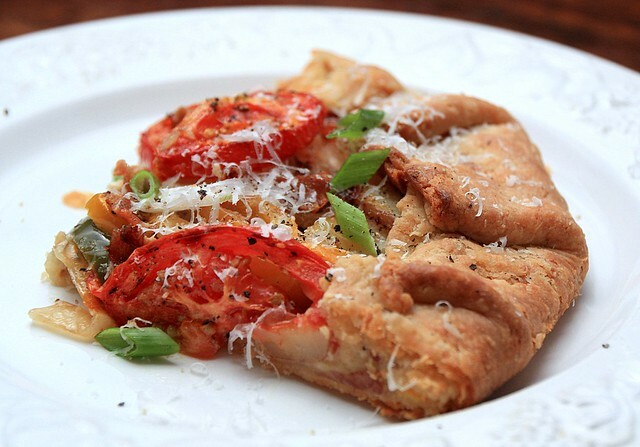 Place the sliced tomatoes on top. Lightly season. Pull the excess dough over the ingredients to partially cover. Carefully slide the parchment from the baking sheet to the hot baking stone and position the galette in the center. Bake for about 30-40 minutes depending on how loaded it is, or until the tomatoes are caramelized and the crust golden brown. 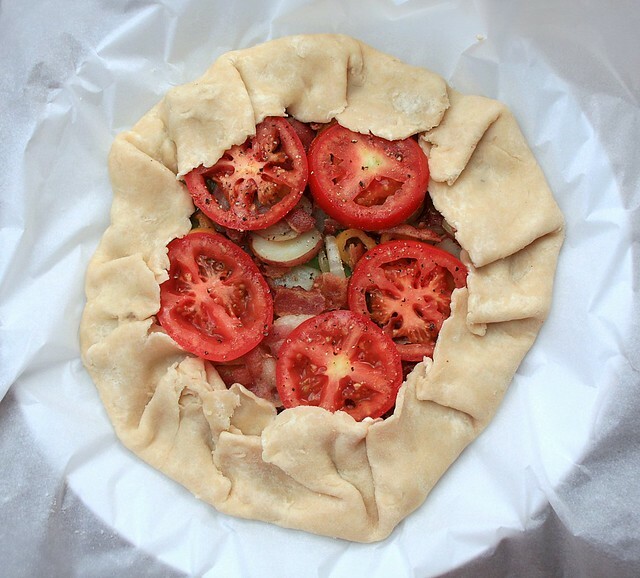 Remove the stone from the oven and allow the galette to cool about 5 minutes before serving. Before cutting into portions, sprinkle with sliced green onions and freshly grated Parmesan. Clearly this is fondly known as a refrigerator dinner. No trip to the store necessary. Any kind of soft cheese will work for this. I like to use it to keep as much moisture from the bottom of the tart as possible so the cheese helps with this. Sauteeing the vegetables before baking them also helps. Any kind of creamy, spreadable cheese will work. I used green, red, and yellow bell peppers for this, but the possibilities are endless. Zucchini and broccoli come to mind and if I’d had either, I’d have used them. Asparagus, corn, mushrooms, green beans or anything you have on hand would also be great. If you plan to use chard, kale, or spinach, it needs to be steamed or sauteed first, then squeezed to remove excess moisture. Of course the bacon doesn’t have to be added to the mix, but that bit of pork fat is so good. If you don’t have a baking stone, then try a cast iron skillet or two jelly roll pans lined together. The idea is to put the tart on a heated surface to get the crust baking and crisp before juice makes it soggy.